The Myanmar District is passionate about reaching the unreached in their nation which is over 90% Buddhist. They have embraced Vision 2020 in which they hope to plant churches in 10 divisions and regions of the nation by the year 2020. They are well on the way of meeting this goal having planted in 8 divisions already. 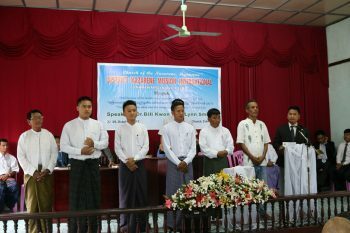 At this year’s 17th Nazarene Mission International (NMI) annual convention held in Zohmun, Myanmar on October 27-29, 2017, six local missionaries were sent using only local funding to Buddhist communities around the country. Last year they sent four. Five local missionaries presented their reports of ministry opportunity in the communities to which they had been sent, encouraging the convention participants and giving them an opportunity to join with them in prayer. The district desires to provide solid missionary training for those it deploys. Dr. Lynn Schmidt, the Asia-Pacific Regional NMI coordinator and missiologist, who was the guest speaker at this year’s convention, has committed to facilitating the first local training session. Pray for the leadership in Myanmar District as they continue to lead in planting more churches and multiplying disciples in this country and beyond. Pray for the local missionaries who are planting churches in the Buddhist communities. Pray for the provision of their needs and protection as they reach out and make disciples in these communities. Pray for the continuous training of local pastors and lay people.